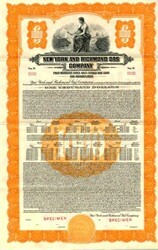 Beautifully engraved RARE Specimen certificate from New York and Richmond Gas Company dated 1941. This historic document was printed by Columbian Bank Note Company and has an ornate border around it with a vignette of an allegorical woman sitting with a city and river behind. This item is over 65 years old andhas 50 coupons attached on the right side. 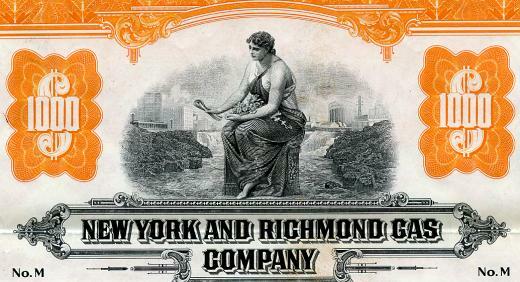 The Brooklyn Union Gas Company, a New York State corporation which was organized under the Transportation Corporations Law of the State of New York on September 9,1895, engaged in supplying gas and gas services to customers in the Counties of Kings, Queens and Richmond, and was subject to the supervision of the New York State Department of Public Service. On January 11, 1957, pursuant to an agreement dated August 22, 1956, The Kings County Lighting Company and The New York and Richmond Gas Company were combined with Brooklyn Union Gas Company. KeySpan Corporation is the fifth largest distributor of natural gas in the United States and the largest in the Northeast, operating regulated gas utilities in New York, Massachusetts, and New Hampshire that serve 2.6 million customers.